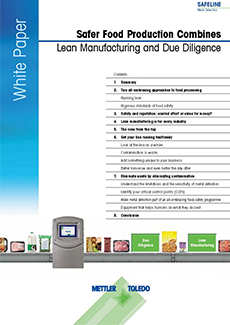 This white paper looks at the convergence between lean manufacturing and due diligence in the food-processing industry. After briefly reviewing the two methodologies, it uses the examples of two recent food-scare stories to show that consumers are willing to pay for safer food. The implication is that any cost-cutting exercise that compromises food safety cannot be part of lean manufacturing. The paper goes on to look at how both methodologies are at their best only when they're part of a board-led, company-wide approach to improving efficiency and product safety. It ends with a short discussion about some key due diligence themes, with specific reference to metal contamination and the use of metal-detection systems to eliminate contamination. 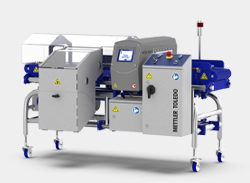 Lean manufacturing and due diligence work in harmony to make your food-processing business safer, more efficient, and more profitable. Although the two methodologies come from entirely different stand points, they point in the same direction. Safety and reputation: wasted effort or value for money? Food safety is a major concern for consumers. If they don't trust your products, they won't buy them. Since consumers think there's value in safe food, you have to do whatever it takes to maintain their trust. You have to exercise due diligence. Food that isn't safe to eat is waste food and waste is expensive. In fact waste is so damaging to business profitability, the business process of lean manufacturing is devoted entirely to elimination of waste in all its forms. You owe your customers and your retailers a duty of care. But it's always nice to know that doing right by your customers is also doing right by your shareholders.